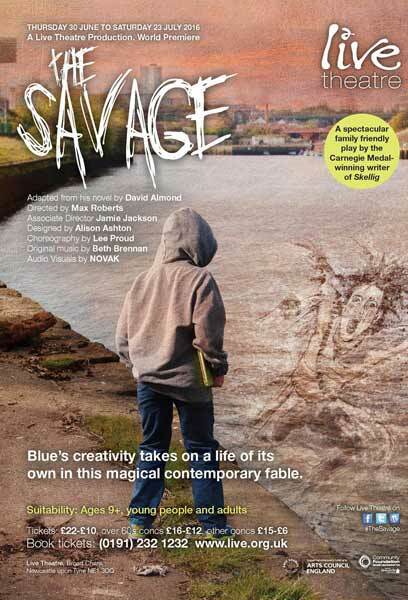 Author David Almond, a past winner of the prestigious Hans Christian Andersen Award, has just brought his acclaimed story The Savage to life as a play, directed by Max Roberts, with its world premiere now showing at Live Theatre in Newcastle. It is a superb production and I’ll say now that if you have the smallest window between now and Saturday 23 July to get to Newcastle to see it, grab the opportunity with both hands. 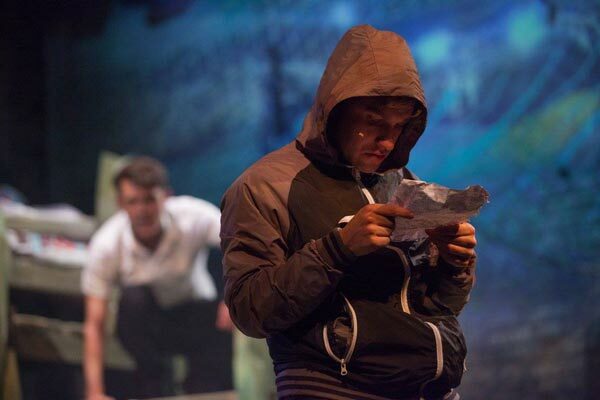 The themes explored in The Savage are universally relevant and wide-reaching: bereavement, bullying, deprivation, friendship, loyalty, love; but it is also very strongly rooted in Newcastle. Knowing that the Tyne was in reality flowing past the end of the road where we were sitting made the rootedness of the whole play all the more powerful. 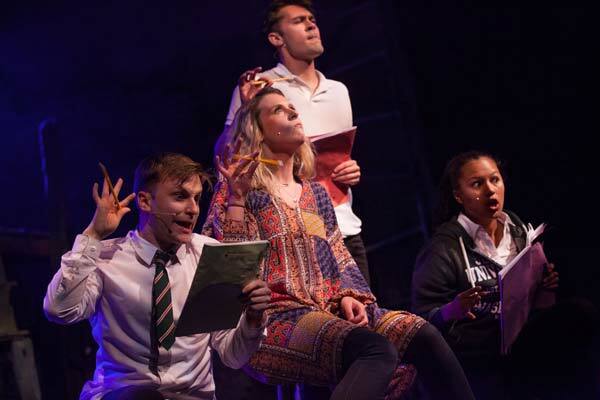 Indeed, allusions both to physical landmarks like the Sage and to topical, recent events including the death of David Bowie clearly resonated with the children in the audience (as well as the adults) and were intrinsic to the constant tensions between fact and fiction within the play. The story is brought to life by an incredibly versatile cast of only four actors who play multiple roles: most notably on one occasion changing before our eyes, with the slick passing of a jacket. The staging is exciting, with a compact set representing both indoor and outdoor spaces, and it is made even more so by the intimacy of the Live Theatre auditorium, with bar tables right up against the stage. 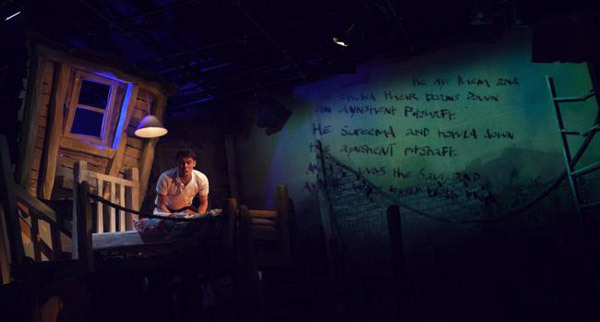 There is beautiful and poignant original and traditional music, both as background music and performed or enacted on stage.The direction and choreography are very physical – and certainly the schoolchildren in the audience loved it when the actors broke away from the boundaries of the stage, leapt from the ladders attached to the side walls or eye-balled them up close. The emergence of the Savage right under the audience’s noses, as the play came to a dramatic climax, had everyone on the edge of their seats. There were two local primary school groups in the audience when I saw the play last week and it was clear from their reactions that they loved it as much as I did. 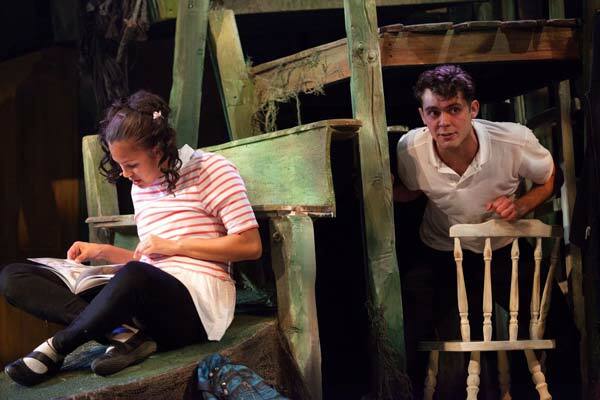 At the interval one boy rushed to his teacher calling, ‘Miss, that was really good!’ and it is certainly especially meaningful for Newcastle schoolchildren to be watching a play solidly rooted in their own local environment. 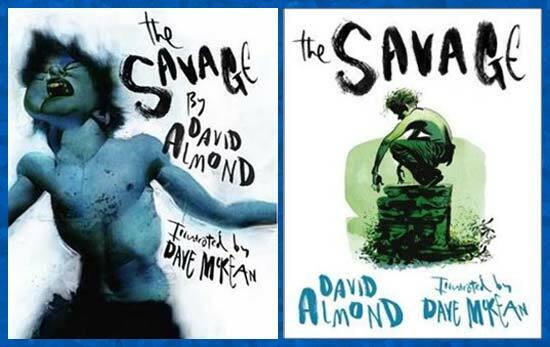 Originally a short story commissioned by ITV and Seven Stories, the National Centre for Children’s Books here in the UK, The Savage is perhaps better known in its later adaptation, part short story, part graphic novel, illustrated so memorably by David McKean (Walker Books, 2008). Now, while retaining the essence of its narrative, it has been further extended, filling out characters and introducing new ones, as well as offering a deep exploration of the relationship between words and imagination and reality. Very near the beginning of the play comes the line, spoken with wonder and directed at the audience, ‘You won’t believe it but everything is true.’ This iterates the wonderful conceit peculiar to the live theatre experience that requires an audience’s complicity and will only be successful if it is done well – and here it is done very well indeed. 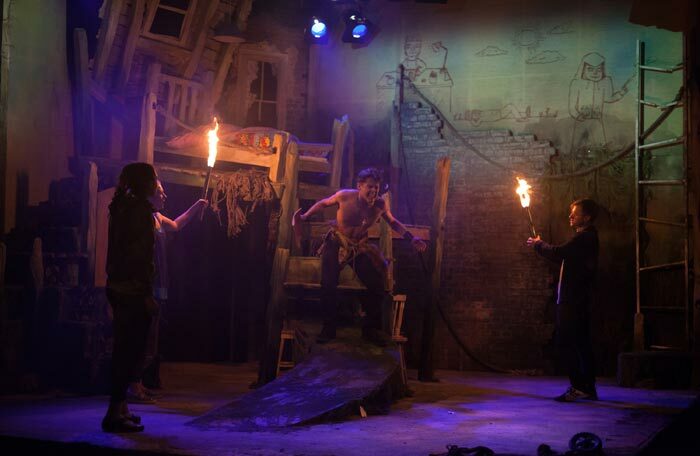 It is especially important in a play like The Savage because truth and fiction within the reality of the play are constantly being called into question. For those who don’t know the story: Blue Baker (played by Dean Bone) is grieving for his father, who has recently died very suddenly. 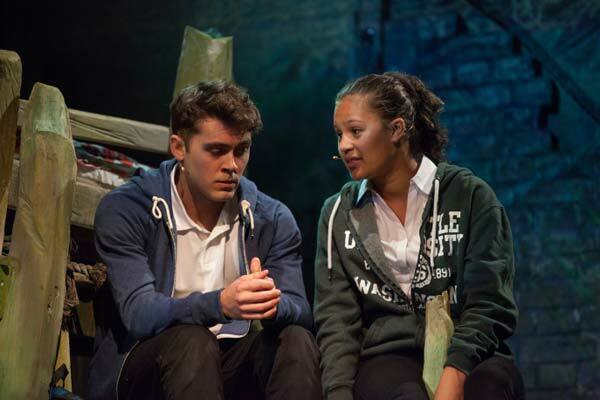 He is also dealing with the unwanted attention of a local bully, Hopper (Adam Welsh), who clearly has his own demons (and I like that the adult characters, and indeed Blue’s best friend Elaine (Kate Okello), seek to draw Blue’s empathy towards Hopper, without condoning his bad behaviour). Prompted to let his imagination fly by his enlightened English teacher (Dani Arlington, who also doubles as Blue’s Mam), Blue is initially uninspired (his imagination is ‘creeping, crawling, not flying’): but then from deep within him there emerges the Savage, a feral boy who eats roots and rabbits and stray people and who has no language, only grunts. At first, it is as though through his pen Blue is channelling his hurt into representing Hopper as the Savage. As his anger finds expression in his writing, however, the boundaries begin to blur between the identities of his own solid reality and his fictional Savage, culminating in an inexplicable, violent close encounter with Hopper that is ultimately healing. The Savage is violent: but—and this is where Almond’s writing is so brilliantly fine-tuned—there is a nuance to the violence of Blue’s writing that, whilst certainly shocking, is perceptibly restrained within the confines of the imagination of someone who has not experienced the kind of violence he is trying to express. Cleverly, the play begins at the end, as it were, with Blue sharing his book about the Savage with his mother. So we know from the start that Blue emerges whole from all that is then played out before us. 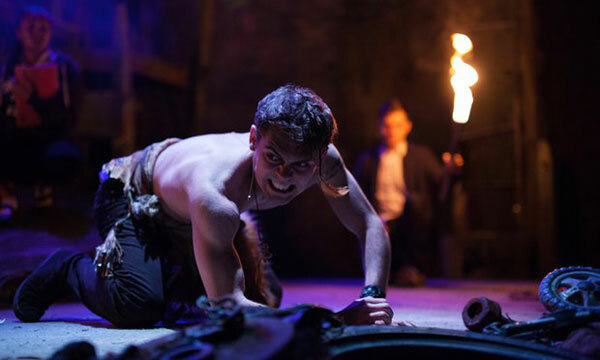 Dean Bone is superb – engaging and slightly cheeky as Blue, but reassuringly ordinary – and mesmerising in his shifts between Blue and the Savage. He had the audience in the palm of his hand from the moment, just like in the book, he apologises about his spelling and the swearing to come but provides fairly uncontestable justifucation: ‘if you can’t swear about something like this, what’s the use of swearing at all?’ As Blue reads his story to us, the words themselves are projected onto the walls, with his barely legible hand-writing and terrible spelling, as well as his own ink illustrations – all fantastically brought to live by NOVAK. I must highlight here the enlightened attitude of his breezy but astute teacher and the headteacher (Adam Welsh again), who, recognising the therapeutic value of Blue’s writing, allow him the space to create his story without insisting on seeing it. I don’t suppose that happens very often and it offers food for thought here. It is not simply idealistic on Almond’s part either: there is a completely plausible interview between the Headteacher and Mam in which she pours out her concerns, because she has seen it. The headteacher seeks to reassure her: they have noted that this is the only class where Blue is communicating at all and he clearly needs the space provided by his notebook to channel his emotions. If his wish for privacy there is respected, they believe that he will come through his anger and grief. But they are not completely leaving Blue to sort things out for himself: they are keeping an eye on him (Dani Arlington plays this very well); they are there if Blue wants to talk; and Mam is encouraged to talk to Blue specifically about his story. The next scene, also in the book, is both moving and laughaloud funny, as Blue reads an extract from his story that he deems less unsuitable for his mother’s ears. 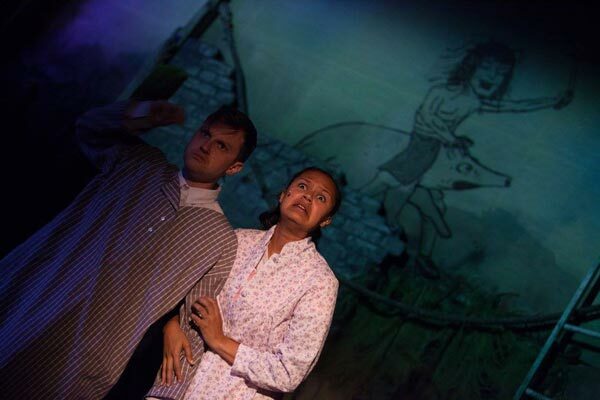 As Blue reads about the Savage’s ride on a pig in the middle of the night, Adam Welsh and Kate Okello evoke huge hilarity from the audience in their portrayal of the down-to-earth farmer and his wife, Mr and Mrs Stokoe, who get out of bed, can’t quite believe their eyes at the view from the window, and return to bed thinking (or at least trying to think) they have dreamt it all. Blue’s best friend Elaine is a new character. She provides the foil to Blue’s turmoil – both through her inherent enthusiasm for life and the happy direction of her imagination. Kate Okello, who plays Elaine, had the audience right there looking with her across the Tyne, watching the seals bobbing in the water. Elaine is staunch in her support of Blue and fearless in trying to stop Hopper from bullying him, but also reaching out to Hopper, aware that he can’t read the letters his father writes to him from prison. Elaine also provides a counterpoint to the story of the Savage: whilst Blue refuses to let anybody see his story, we in the audience have followed it all the way through, so when Elaine shares her story in class of a monster bear in a deep, dark cave, we experience a frisson of recognition. 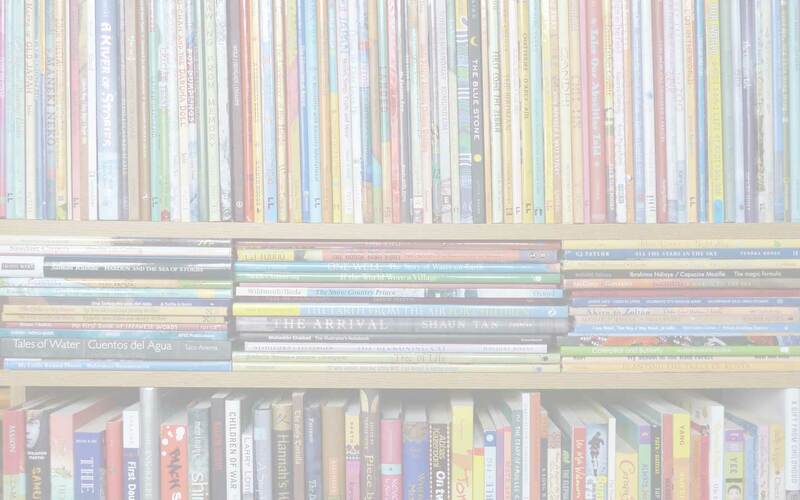 The school scenes not only offer some welcome light relief, they provide a forum within the play for discussion about the importance of language (not to mention a model of how to inspire children to be creative and write from the imagination). Before I finish I must just also point to an allusion in the play that is fairly understated but quite relevant and potent to anyone interested in children’s books. Blue’s little sister Jess (Kate Okello again) can be seen at the beginning of the play leafing through Maurice Sendak’s 1963 classic Where the Wild Things Are – and it’s the story she later asks Blue to read to her while they are having a walk and a picnic together. Just before they head home, Blue catches a glimpse of something – someone – watching them and calls out an introduction: a moment of collision between Blue’s real world and his creation. Not understanding what has just happened, but clearly slightly ill at ease, Jess asks if their Mam will have supper ready, like in the story – in a sense, seeking the same reassurance that Max finds at the end of Where the Wild Things Are. In many ways there are parallels to be drawn between Where the Wild Things Are and The Savage: both explore the themes of anger and creativity drawn out of anger. The contrasts too are noteworthy: for example, in the picture book Max steps out of his reality, becomes the king of the monster-like ‘wild things’ and then returns to a world that has regained its equilibrium ; whereas in The Savage, the dividing line between reality and imagination becomes disturbingly blurred and Blue re-finds his place in the world only after the monster (and is the Savage, in fact, a monster?) of his own creation has collided dramatically with the causes of his suffering, both tangible (Hopper) and intangible (his father’s death). Adam Welsh, Dani Arlington, Dave McKean, David Almond, Dean Bone, Kate Okello, Live Theatre (Newcastle), Max Roberts, NOVAK (Newcastle), The Savage, theatre adaptation of children's books, Walker Books, Where the Wild Things Are. Bookmark.